The scenery was quite spectacular as we headed past Honningsvåg on our way south to Olderfjord. You have to look at the map to see the spectacular trip we are taking here. 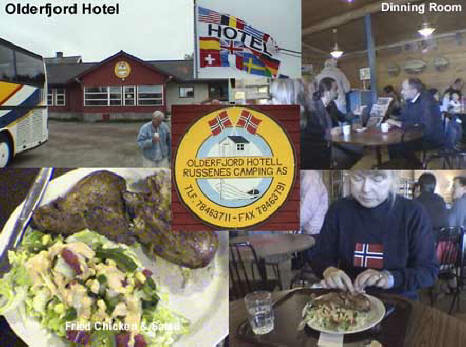 We left at 2:45 PM and Marcia drove the 65 miles to the little stopover town of Olderfjord. On the route we had to come to a screeching stop as a large buck reindeer lumbered onto the highway followed by an entire herd (below left.) We had to wait until the “tail” buck was the last one over. 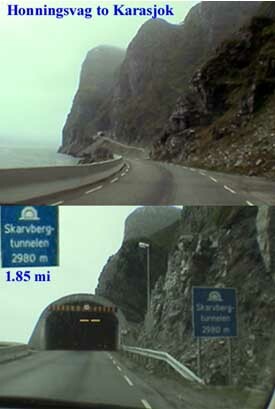 She then continued on until we arrived in Russenes at 4:00 where we filled the tank and Marcia had lunch in the little traveler’s café of the Olderfjord Hotel [, +47-7-846-3711.] She had fried chicken with salad while I had a plain coffee and shopped through the store and bought two reindeer skins that we used to sit on for the rest of the trip. 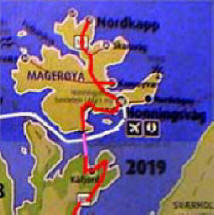 I then drove the next leg of 85 miles south to our destination of Karasjok [Car-rahs-chock]. While driving, I spotted the Politi (police) radaring me and I slowed down rapidly. I must have been successful, since they didn’t come after me. I sure don’t need another police stop on our last day in Norway as I did when we entered the country. The DUI laws are now that the fine is 10% of your annual income and they publiah in the newspapers a list of those who have paid the highest fines. We arrived in Karasjok at 6:20 and it took a little time to find this half-baked hotel I had booked since all the others were full. The Kroa Hotel [, +47-9-923-4655] is a little out of town and there was no one at the reception desk. I found a note that said to call a cell phone which I did. The guy answered with poor English and said he would be there soon. After a while Clemet showed up in his pickup truck and checked us in. Our room was in the building across the road and it turned out to be quite nice in a rural sort of way. By 7:30 I went out for my run and ran through the town and then to the Sapmi Center. 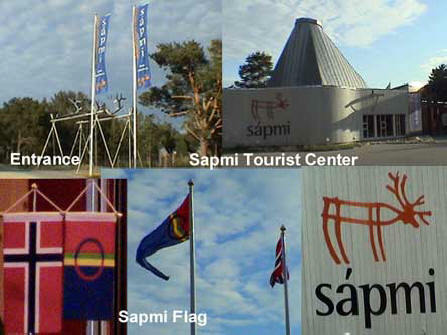 Sapmi or Sami is the new name the Lapps have chosen for themselves. 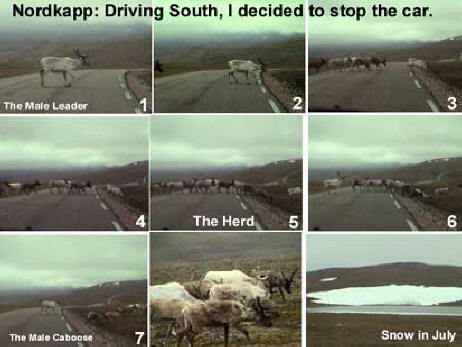 Like everyone, they didn’t like the name Lapp they had been given. Lappland or Sapmi starts just north of here and covers large areas of Norway, Sweden and Finland. 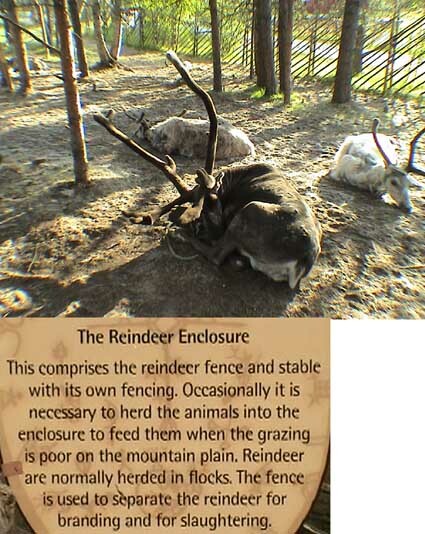 The culture is one of living off of reindeer herds which roam free but they know which ones belong to whom. They brand them, but it’s still a mystery how they keep track. 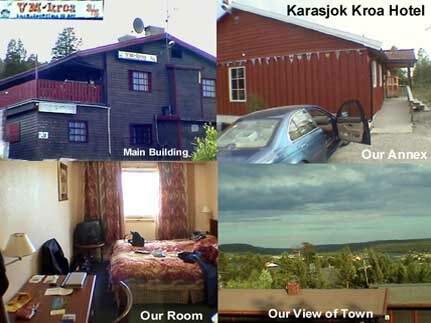 Karasjok is their capitol and 80% of the people who live here are of Sami origin. 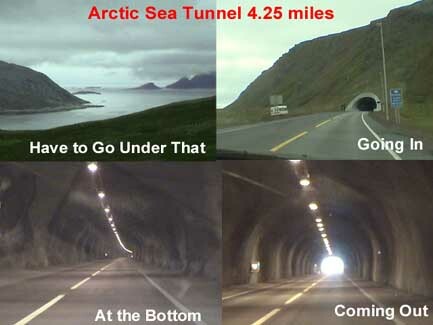 We are still in the Norwegian county of Finnmark. The city is called Karásjohka by the Sami. The extremes of temperature here go from a hot of 90° F to a cold of -60.5° F. I don’t want to be here when it’s that cold. 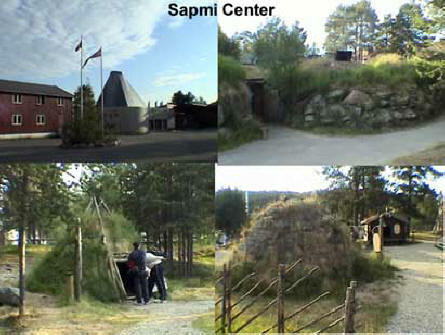 The Sapmi Center (or De Samiske Samlinger, +47-7-846-9950) is a tourist center museum to show the history and lifestyle of the Sami peoples. 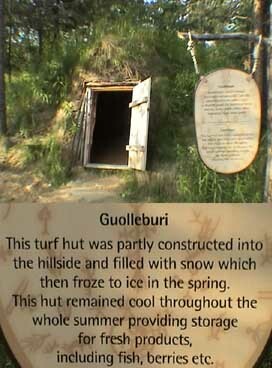 After finishing my run, I wended my way through all the exhibits of mound huts, reindeer, tents and even the special Sami restaurant built inside a hill (left.) They had central pit fires with seats surrounding them. I talked to one of the waitresses and she told me that the chef is the same one for the big Rico Hotel right next door and the menu was also the same. The restaurant was really just a kitschy place for the tourists and was about to close. I got back to the room and told Marcia about this and she said she preferred to eat at the hotel. After I changed, we drove over to the Rico Hotel [, +47-] and had a very interesting meal in their formal dining room. 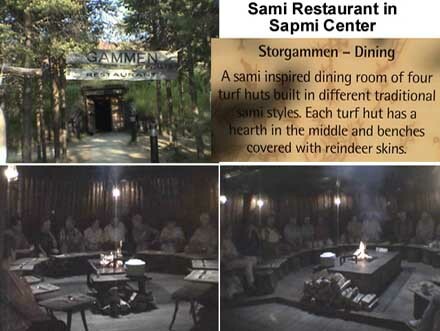 The room was covered with male and female dress of the Sami people (above.) We shared a bottle of Spanish Rioja wine and I also had two beers before doing that. For starters, we each had a trio of smoked reindeer, trout and Arctic roe. 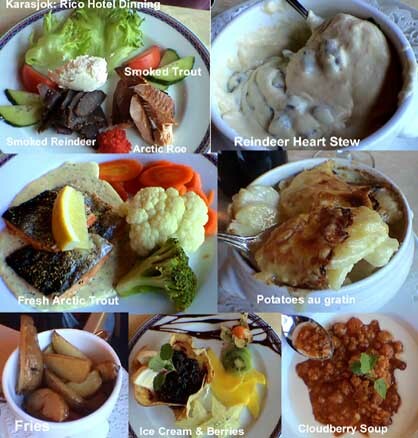 I had something very unusual; reindeer heart stew which was good but I wouldn’t routinely order it. Then we each had an order of Arctic trout and I had a side of potatoes au gratin. For dessert, Marcia had cloudberry soup and for dessert I had ice cream with berries. It was all interesting and fairly good. After dinner the whole place was very quiet so we headed back to the hotel. I worked on the Oslo photos, so you can see that I am beginning to get behind by about 2 weeks. I finally went to bed at 3:30 AM.